I had just sweat my way up a jungle trail when an old man with six-pack abs and a calculator watch invited me to the royal bathtub. In that moment, I knew it was going to be a good day. I had already spent a week admiring the temples of Siem Reap in Cambodia, which draw visitors from all over the world, and I’d learned some amazing facts. Facts such as: The main pyramids of Giza would fit inside the moat of Angkor Wat. It’s a stunning place, but my friend and guide, Stéphane de Greef, reminded me that the temples are only part of the story. If I wanted to understand the temples and the Los Angeles-sized city that had surrounded them, I would have to understand the water. I met the man with the abs and the calculator watch after driving an hour from Siem Reap and hiking the trail to our starting point, the headwaters at Kbal Spean (“head of bridge” in Khmer). The banks of Kbal Spean feature elaborate carvings. After exploring Kbal Spean, Stéphane and I spent the rest of the morning on his dirt bike following annotated satellite maps as we weaved through rough tracks, followed the river and watched it grow. At one point, a dried river channel led us to a scorched cassava field with soil so hard it seemed to choke the plants. Later, we passed a wary water buffalo to find the broken pieces of a tiny, unmapped temple in the middle of a farmer’s field. 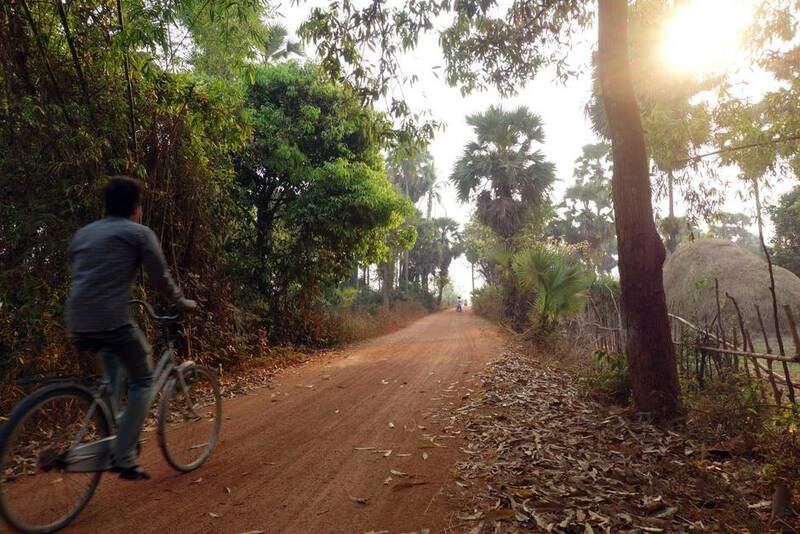 Everywhere, the landscape clings to its Angkorian roots – simple wooden houses, forest fringe and rice fields. As the temperature neared 40 C, Stéphane found a sand track that led back to the river. We parked and headed through the jungle in search of the spot, now forgotten, where the wild course of the water turned down an ancient canal on its way to the temples. By the time we reached this corner – after a few transects and a chat with a farmer in bare feet and a pair of dress pants – I was dripping with sweat. The channel wasn’t much to look at, but it held a lot of meaning. In that spot, a 1,000-year-old enterprise had changed the landscape and life for everyone on it. I felt proud we’d been able to find it near the end of an abandoned road. Today, that particular canal becomes the river that runs through Siem Reap, Cambodia’s tourism hub. Sadly, my moment of triumph was short lived, as biting ants began marching up my legs. I took a quick picture of Stéphane and headed back to the bike. Many small reservoirs and ponds, like this one, still support fishing and agriculture. We decided to head west to a similar canal, called the North Channel, and follow it south; the North Channel was part of the same watershed and would lead us right to the temples. The red dirt roads became asphalt again, and we accelerated past the silhouettes of skinny palms. I welcomed the wind on my salty cheeks. I was beginning to slump after many spine-jangling hours on the bike when the north gate of Angkor Thom, the famous walled city of Angkor, emerged from the trees. As night began to fall we stayed on course, letting the water lead the way. Large stone faces gazed out into the forest. Our bike zipped south to the central temple, Bayon, then took a turn to the west. Past another gate, out into the dusk, we found the outflow from the moat. This man made channel glows at sunset and leads into the enormous reservoir called the West Baray. A golden path of shining water stretched in front of me. Teenagers swam and fished in the water, and over the trees I could see the West Baray, giving life to the land around it. That distant view of the water that had inspired our journey was a good end to Day One. After an early breakfast, we began Day Two back on the Baray’s beach. A woman patched inner tubes over an open flame, preparing them for rent to local beachgoers. We zoomed along the south shore and toward our final destination. 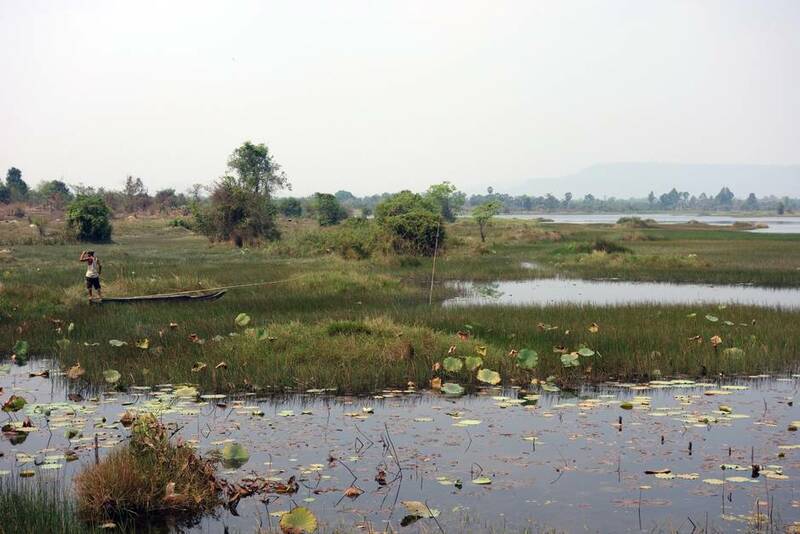 Life south of the Baray, along the water channels, is more lush. Everything seemed greener and the rice was higher, thanks to those ancestors and their iron hand tools. It was easy to follow the water by then. Our boat was the skinniest of the group tethered at the channel. Ngong, our driver, helped us in and fired up the two-stroke engine, which filled the air with a blue haze, and we were off. Initially, there wasn’t much to look at. Occasionally, we passed men and women casting small fishing nets, which always seemed to come back empty. The sand banks and straight channel eventually widened and we entered rushes and marshes. I could smell the lake ahead. Bee-eaters, small birds with shining blue and green feathers, began to appear on the reeds. Ngong carried on through the village of Mechrey, past the floating houses and floating gardens with banana trees. Soon, we were the only boat in sight, and we followed flying storks and adjutant birds with our binoculars until there was nothing ahead but water. We had reached the little stream’s final destination, Tonle Sap Lake. Silty water stretched to the horizon. A lone fisherman waded up to his chest to check a net. Ngong powered down the roaring engine, refilled the gas tank and lit a smoke. The silence was beautiful. In two days, we’d spanned 1,000 years to reach the present moment. Several of these stops are accessible as day trips from Siem Reap. Accommodations in the city are plentiful. Expect to pay at least $35 for a clean, private room but you can spend a lot more on high-end accommodation. The dry season is from November until May, but it gets very hot from early March. The rainy season can be beautiful, with more greenery, but it also has more mosquitoes. Almost any hotel can find you a reputable certified guide, and specialty guides such as Stéphane De Greef (stephanedegreef.com) are available. Prices run from $40 to $350. Note that temple passes may be required for some of these sites and motorbikes are not rented to tourists. The headwaters at Kbal Spean are in Phnom Kulen National Park, one hour by car from Siem Reap ($40 to $50). Tuk-tuk transport is possible and it’s cheaper ($25 to $30), but it’s a slower, bumpier ride. A walk along the top of the Angkor Thom wall, above the moat, is possible from any gate. The West Baray is reachable by tuk-tuk from town and is popular with locals. Boat tours to several floating villages, including Mechrey, are available, but check distances as the lake changes dramatically between seasons. Ask about going further, to the lake, or take a pricier tour through Prek Toal bird sanctuary to see Tonle Sap Lake en route (samveasna.org or others). Jennifer Kingsley is a writer, broadcaster and the author of Paddlenorth: Adventure, Resilience, and Renewal in the Arctic Wild.